This week was really busy for this usually lazy mom. 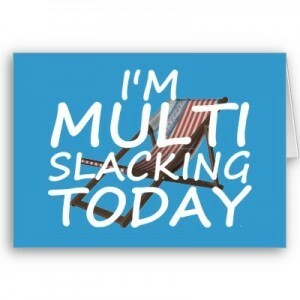 I learned a new term this week that I hope to practice next week: multi-slacking! The most important event this week that we all shared was remembering 9/11. I have a couple of related links and some to cheer you up afterwords. Here’s what I found while you were remembering and honoring. Near misses on 9/11 – As a Christian, I don’t really believe in near misses. It is interesting to see how people have lived out the feelings that escaping death brings and how their beliefs filter the way they see what happened. The article is uplifting after a week of reliving the sadness. One biological father, 150 children – Speaking of (writing of?) the messed up world we live in, this article tells of a very modern problem that has serious implications. Children of sperm donors are finding out they have many half-siblings, a lot of half-siblings. Could the guy she feels so drawn to at college be her soul-mate or maybe her half-brother? Celebrity heroes – This slide show is a brief retelling of many stars who have saved people from harm or even death. I was amazed by how long the list is and that a few of them have rescued people more than once. The cynic in me was very skeptical, but these are documented cases of bravery among some unlikely celebrities and some that are so likely to save you, it is almost too good to be true. Sara Groves’ sense of humor – I admire Sara Groves for her deeply spiritual words of encouragement and faith. I am a huge fan. I also love when she just shares some of the truth of her life that makes me laugh. The person who posted this video did a great job. This entry was posted in Friday link-sharing feature and tagged celebrities saving lives, children of sperm donors, fun songs of sara groves, sara groves, sperm donors, st ories from 9/11 by lookmom. Bookmark the permalink.